Who has not noticed that Black Friday has crept into the UK from the USA, even though we do not celebrate Thanksgiving Day that it follows on from? Although in 2014, the first year of the UK’s participation, there were scenes of chaos and fighting and some websites crashing. However, 2015 was a much quieter time with many major retailers, headed by Asda, refusing to participate. Amazon still had many online bargains but started a week before, muting the response. So does the UK adore bargains? Of course we do, just we do it differently to the Americans. They have coupons; we have vouchers, especially the many thousands that can be found on VoucherBin.co.uk, the leading UK voucher site. Alongside old school vouchers we also have the ever-popular BOGOF, which means Buy One Get One Free. As early as 2012, ShopCentric undertook a national survey that concluded that BOGOF was the nation’s favourite money saving deal and little has changed in 2016. Stores then brought out ‘buy three, cheapest free’ deals. Then we have the Meal Deals, first started by that British institution Marks and Spencers and then copied by the likes of Sainsbury, Tesco and Asda. The Meal Deals are two or three courses, often with wine, for a set price. Major supermarkets are, of course, battling the two discounters Aldi and Lidl for market share. The Guardian in December 2015 declared that 50% of families now shop at these two shops. The big five, namely Tesco, Sainsbury, Asda, Waitrose, and Morrisons, are all suffering major drops in both their share values and their market share. Smaller supermarket chains such as Budgens, Co op and Farmfoods have cut back their branches, as they are unable to compete. Clearly supermarket shoppers are chasing bargains for their household shop. Iceland has cleverly positioned themselves to the savvy shopper, producing many food items for £1 or £2. They often have quality food such as lobster at easy to stomach lower prices. In 2014, ThisIsMoney declared that the UK spends about £2,000 a year online, more than any other developed country. The rise of comparison sites such as MoneySupermarket, USwitch, PriceGrabber and the major shopping comparison Kelkoo has led to people comparing current deals, getting the lowest price, regardless of seller, and chasing discounts and deals. The Observer commissioned a survey from ElectriQ that showed that shoppers only showed loyalty to seven brands, down from the fourteen of just five years ago. Clearly, people are chasing discounts that override their brand loyalty. At the bottom of the discounting shops are the pound stores such as PoundLand and PoundWorld. It seems that there is at least one of them on each high street and they are even moving online. It seems that when Woolworths crashed and burned, the pound shops moved in – many of them even taking over the old Woolworths stores. At the start of 2012 PoundLand had 400 stores and at the end had 460 and that growth continued through 2014-2015. The “stigma” of shopping in pound shops has also disappeared and the shops are even placed in what can be considered wealthy areas such as Windsor – that has at least ten shops in its vicinity with a PoundLand in its high street. ThisIsMoney decided that “PoundLand has gone horribly middle class“. It seems that even the rich are chasing bargains. PoundLand stats show that in excess of 3.5m customers a week shops with them and that 11% are from the AB social group, giving them a half-year profit of £21.5m in 2012 up by 81.5% on the previous year. Even though many of their products are end of line or from distressed stock they also make their own product lines and bring in others. They stock Duchy Originals and National Trust bird food. Surprisingly they sold £6,000 worth of copies of Hamlet in just two weeks for example. So successful are the pound stores that the big supermarkets are experimenting with £1 lines and aisles themselves. To save money, vouchers are by far the best, with a guarantee to get the mentioned discount. Whilst extreme couponing is an American trend, the British are getting into the act. 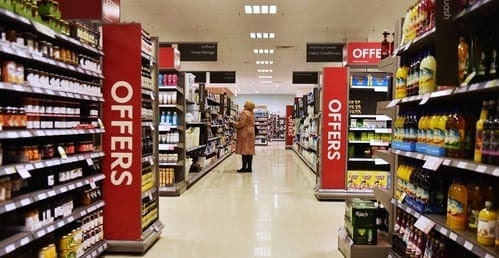 Labelled ‘Voucher Vultures’, people are appearing who save hundreds if not thousands off of their weekly shop as well as their bigger purchases. You might want to take a look at VoucherBin as they have thousands of vouchers for many different purchases, many of them you cannot find elsewhere.